Use the form below to inquire about CGH Jungle Resort at Lakkidi . Use the form below to reserve for CGH Jungle Resort at Lakkidi . Wayanad Wild CGH Jungle Resort at Lakkidi has everything you are looking for in an exotic jungle holiday. At CGH Jungle Resort at Lakkidi, you can live amidst the wilderness, in a quiet, quaint spot right in the middle of the rainforests of the Western Ghats. The jungle stay offers a surreal experience in Lakkidi, which is believed to be amongst the highest spots that you could tread to in Wayanad. Complete with lush green vegetation, mountainous backdrops, and murmurs of the streams, this location offers connections with untamed wilderness like no other. This CGH Jungle Resort at Lakkidi is all about connecting with nature whilst living in a habitat that is as close to nature as possible. It not only offers a great stay and unforgettable experience out in the wild but also imparts positive vibes, which is evident in every streak and sphere of the property. Enough emphasis on natural resources is paid to conserve nature to the best extent possible. Rest assured, a warm welcome awaits you as the hosts, in-house professionals, and workers at the property take you in as their family members, and not mere guests. The accommodation at this Jungle Resort is so pleasant and enjoyable that you will come back to this place again and again. The guests get to enjoy in-house amenities as well as the beauty of nature through their jungle-facing windows. The property offers a whole lot of facilities, including house-keeping services round the clock, outdoor pool, and a restaurant that stirs up a storm with its authentic cuisine especially made from local produce. And what could be better than a quintessentially Kerala dish, rich with mind-blowing flavors and the aroma of fresh spices? 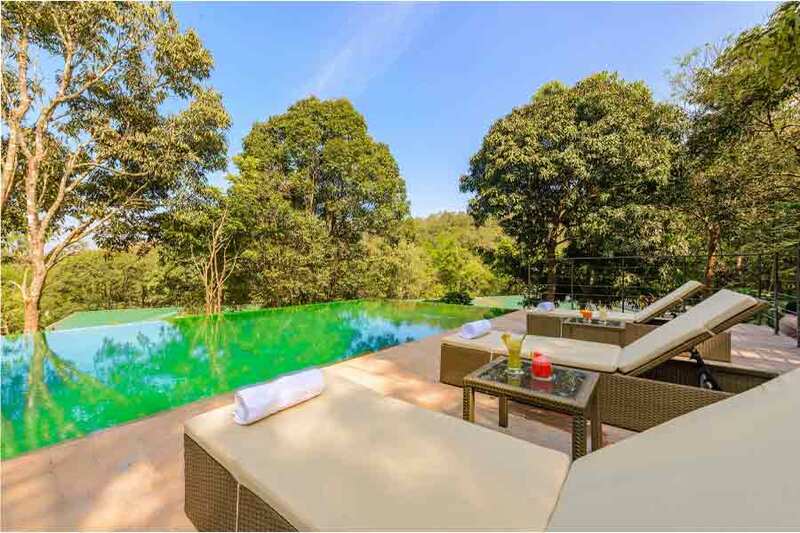 Right from chilling by the poolside to admiring the nature or taking a guided walk through the rainforest, you get to live it up against the majestic landscapes and wild encounters in the heart of the woods. Whether you are planning a family holiday with your spouse and kids, a romantic getaway with your partner, a backpack tour with your tribe of friends or a trip alone to appease the photographer in you, this jungle stay property is just the right place to be. At Wayanad Wild, check-in time is 2 PM and the time for check-out is 11 AM. All extra persons of 5 years and above will be charged extra occupancy charges. The charges are per head per night. It should be noted that in a room, only one extra person of 5 years and above can be accommodated. Some of the activities, irrespective of whether they are part of the package or chargeable, are subject to change due to external conditions such as bad weather. At Wayanad Wild jungle stay, you can avail the services of bonafide tour leaders. Groups that comprise of more than 9 and less than 15 full-paying members can get a discount of 50% on tour leaders. If the number of full-paying pax in your group is 15 or more, you can avail the services of the tour leader free of cost. Individual travelers can cancel a confirmed booking and group travelers can reduce the number of rooms. All such cancellations and amendments are subject to cancellation charges. The cancellation of a confirmed reservation by an individual traveler within 30 to 15 days before the date of check-in will attract a cancellation fee of 50% of the total booking amount. If an individual traveler cancels the booking less than 15 days from the date of check-in, the cancellation fee will be 100%. In the case of group inclusive tours, any reduction in the number of rooms between 30 to 15 days from the date of arrival will be charged a cancellation fee of 50% of the booking amount. If group inclusive tours reduce the number of confirmed rooms less than 15 days prior to the date of arrival, 100% cancellation fee will be levied. There is so much to do in and around this Jungle Resort as you are not restricted by boundaries. Take a plunge into the wilderness and go strolling on your own to uncover new experiences. It’s literally a jungle out there. Get yourself acquainted with the Lakkidi rainforest and enjoy the lush greenery enveloping the woods. If a tour is on your mind, then take up a guided tour with the naturalist in the early hours of the day (7 AM to 8 AM), engage in bird watching or simply meander along the beautiful streams. The place is no short of a treasure chest for photography enthusiasts; the Shutter Up program will allow you to take photographs inside the property under the guidance of a naturalist. Those who enjoy trekking can go for a complimentary trekking session in the nearby hillocks. Those looking for a time of relaxation within the property can make use of the swimming pool, imbibe the surreal views, and savor authentic local food made in the kitchen using local produce. Alternatively, you can explore the property, participate in the cooking demonstration, or attend a presentation on Wayanad. That’s not all. You can go for bamboo rafting or zipline adventure for a bit of adrenaline rush. You can also take a 3-hour guided walk (called Onnam Kettu) to a secluded mountain stream and enjoy the flora and fauna on the trail. Rest assured, this not a physically-demanding activity and you can walk all the way up to the stream through a beautiful tea estate even if you are not a regular gym goer. The closest international airport is Calicut International Airport, at roughly 70 km from the property. The next one is Mysore Airport (180 km) which, however, is a domestic airport and serves very few cities. The international airports at Cochin, Mangalore, and Bangalore are located at a distance of about 216 km, 290 km, and 370 km, respectively. Wayanad doesn’t have a railway network, so rail enthusiasts can board the train to nearest railway stations. Kozhikode (Calicut) Railway station, which is about 60 km from the property, is the nearest one. Kozhikode has regular train services between many major cities in India such as Chennai, Bangalore, and New Delhi. Railway stations in Thalassery (105 km), Kannur (126 km), and Mysore (195 km) are other options you can consider. In order to reach the jungle stay, you should take a road trip after reaching either of these stations. Those who like to take the wheels can easily reach the resort from Mysore and Bangalore. For a drive to the property from Mysore, you should cover about 170 km; from Bangalore, it is about 330 km. Nearby towns in Wayanad include Vythiri (10 km), Kalpetta (20 km), and Sultan Bathery (45 km). Masinagudi (110 km), Ooty (132 km), and Coorg (138 km) are some of the popular tourist destinations located close to the property.